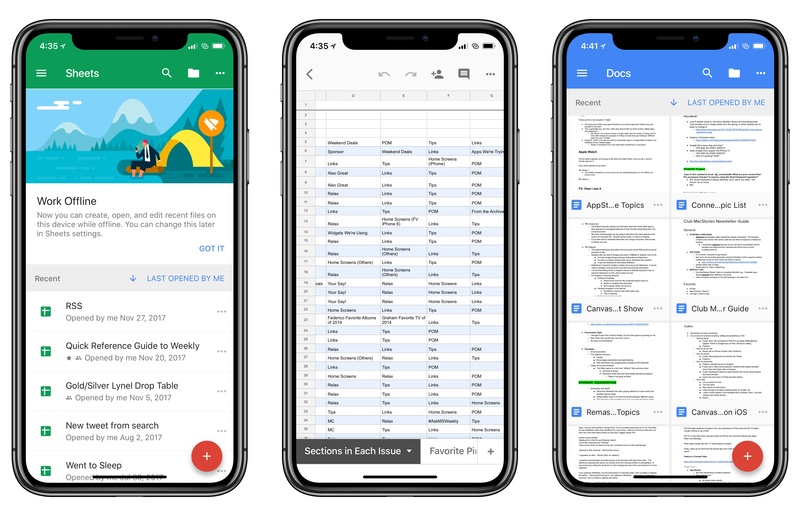 In a series of updates released this morning on the App Store, Google brought support for two highly anticipated iOS 11 features – iPhone X compatibility and iPad drag and drop – to their Docs, Slides, and Sheets apps. On the iPhone X, Google's apps now take full advantage of the larger display, extending to all four corners of the screen; toolbars are integrated with the device's unique form factor, but, overall, the UI update is mostly unsurprising. If anything, it's nice to be able to read longer documents without letterboxing. Things are more interesting on the iPad, where you can now use multi-app drag and drop to insert content into Google's apps. In Google Docs, for instance, you can drop a link from Safari, an image from Photos, or a text selection from an email client directly into the editor. Drag and drop in Google Docs for iPad. In my initial tests, it appears that, as with copy and paste before, Google Docs doesn't support receiving rich text from other apps – when you drop formatted text into a document, it gets converted to plain text. 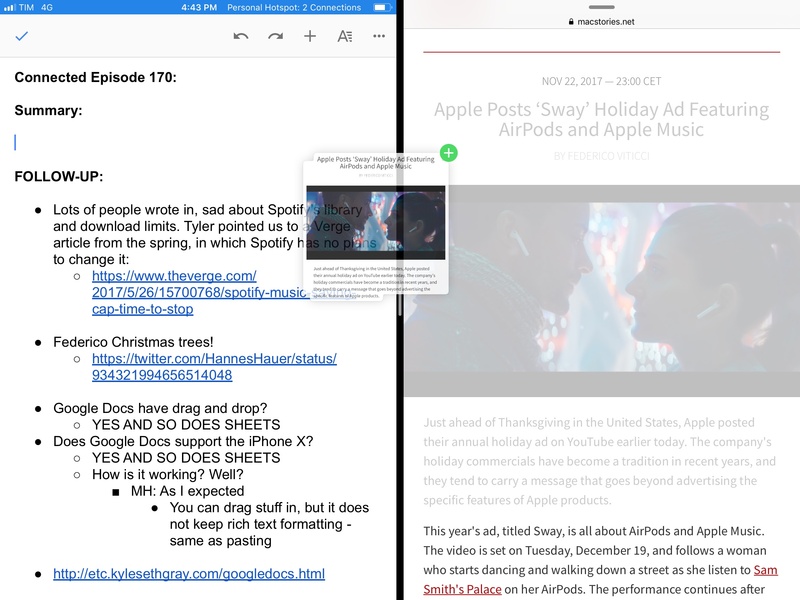 However, as someone who regularly does a lot of research in Google Docs, collecting bits of information from different iPad apps, I'm just glad to have basic support for drag and drop in the app, even if it's not as advanced as other note-taking apps. Despite some limitations, it's good to see that Google was able to update their popular productivity apps for iOS 11 and the iPhone X before WWDC 2018. The updated Docs, Slides, and Sheets apps are available on the App Store.